A major fire ripped through Notre-Dame cathedral in central Paris late Monday, forcing the evacuation of thousands of visitors and causing French President Emmanuel Macron to postpone a planned speech to the nation. 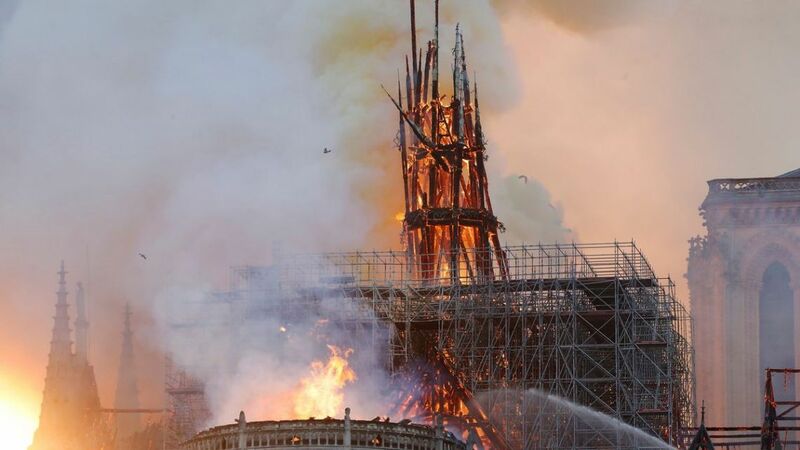 Live television footage showed flames engulfing the roof and spire, and smoke billowing out into the evening skyline of the French capital. The cathedral, located on an island in the middle of the Seine River, has been under renovation, with scaffolding covering much of the roof. Thousands of onlookers were being kept at a distance by police as ashes fell onto streets surrounding the monument. The cathedral is a major tourist destination and visited by up to 50,000 people a day. Paris Mayor Anne Hidalgo said firefighers were on the scene and she asked everyone to respect the security perimeter.